The premiere exhibition, which fills all the rooms, opened on Oct. 30. The new museum uses interactive multimedia displays to provide a glimpse into the tragic pages of Russian history. "Today's event resonates far beyond the city’s limits, even if it is the capital,” said Natalia Solzhenitsyna, the wife of Nobel Laureate Alexander Solzhenitsyn, author of “The Gulag Archipelago,” at the opening ceremony for the museum. “It is felt nationwide." Gulag – an acronym that has become known throughout the world – refers to the once secretive Main Directorate for Corrective Labor Camps. It decided the fate of millions of prisoners, so it is not surprising that the name of the agency later became the symbolic word used to represent Stalin's repressions. In 2001, the Museum of the History of the Gulag was founded in Moscow on the initiative of Anton Antonov-Ovseyenko – a historian and social commentator, who passed through the prisons and camps as the son of an "enemy of the people." Almost immediately after opening to the public in 2004, it became clear that the project lacked space, storerooms and financing to fully implement its activities. The idea of a new building for the museum and expanding its capacity was strongly supported by the Moscow city administration. The museum is housed in an early 20th-century four-story residential building, located on Pervy samotechny pereulok (alley) near the city center and was renovated by Kontora, a Moscow-based architectural bureau. "With the move to the new building we are going from being a small museum into a large museum center of international stature," said Roman Romanov, the museum's director. "We have increased the exhibition space by nine times, have received plenty of space for storage of exhibits and have expanded opportunities for research,” says Romanov. “We already have a volunteer center and a studio of visual anthropology here; a bookstore and library will be opening soon." The premiere exhibition, which fills all the rooms, opened on October 30, the Day of Remembrance of the Victims of Political Repression. 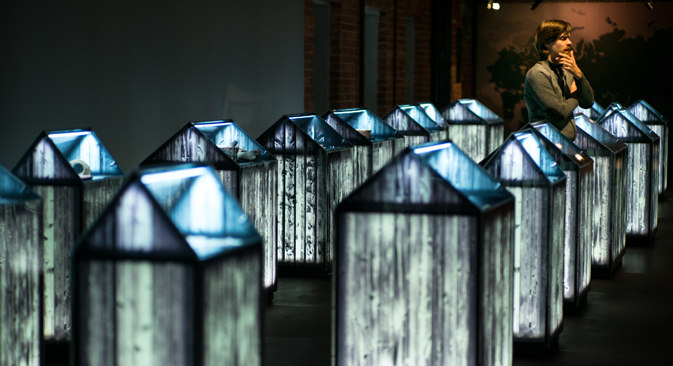 The exposition project, slated to last for one year, has been implemented with the participation of 25 Russian museums and archives, each of which is devoted to specific aspects of the Gulag’s history.